Michelle and I had a nice day out and about running some errands and playing games. 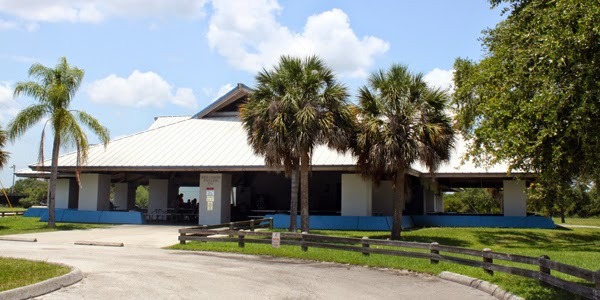 All of our activities were in the Merritt Island area and that minimized mileage. We started with a stop at Camping World. There we usually drop big bucks, but today we just picked up a cartridge for our fresh water filter. We had a coupon, so the filter which normally costs about $27 only set us back $2. Of course we spent time browsing the store looking for things we couldn't live without and didn't find a thing. East under the highway to Sam's Club for a few grocery items and then continued east several miles to Kiwanis Island Park, interrupted by a lunch stop at a Five Guys burger joint. 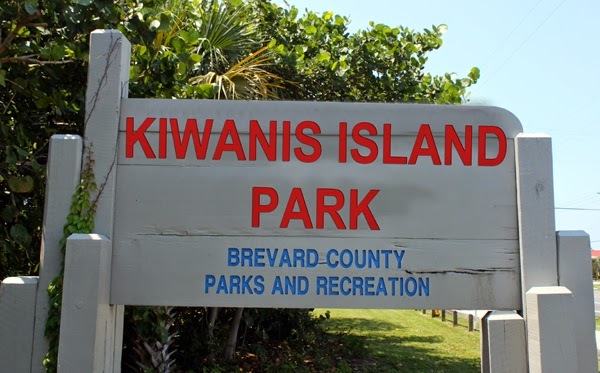 Kawanis Island Park was our destination today to attend a geocaching event GC5HYBP -- Castaway Cachers Trivia Night on the Space Coast. We arrived quite a bit early so that we could capture the five letterboxes in the series AQ238337 – Kiwanis Island Park: Get Out There and Play placed by Three Flamigos. The five letterboxes were Baseball, Basketball, Racquetball, Kayaking, and Tennis – all carved by GypsyLadyBug. The sixth box in the series, Volleyball, went missing some time ago. Baseball had a logbook so we spent some time looking over the stamp images of previous letterboxers. As we found each letterbox, we noticed a Munzee very close by, so we picked up Munzee points along with each letterbox. I used my smartphone App to see if there were any more Munzees in the area. Foolish me! Of course there were. Munzees are like mosquitos – they are everywhere. I grabbed a few nearby. Continuing our exploration, we found GC3PPDA -- Kaelyn's Kache, a geocache placed by DalenBarb. There is a sad but very informative story described in this geocache. Even if you don't search for the cache, you should look this one up on the website and read the story. We did find the cache however. We were having a successful afternoon even before the main event started. We still had some time to kill before the appointed dinner hour, so we returned to our truck to relax a spell and recharge our phone batteries. While sitting there, we noticed a growing group of people assembling near the pavilion. We later learned that these were the "Castaway Cachers". 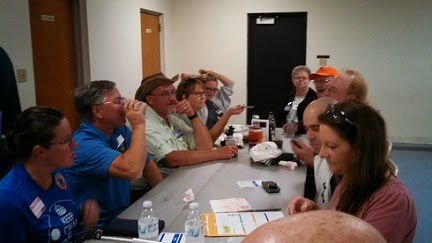 Geocachers who were arriving to leave tomorrow morning on a nine day geocaching cruise of the islands in the Caribbean. 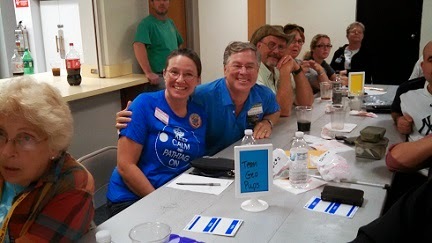 Tonight's trivia event was arranged for them by Dale and Barb Swinehart of Space Coast Geocaching Store as a pre–cruise event. What a neat idea. Time for dinner and the main event. Dinner was a pulled pork sandwich with baked beans, coleslaw, and a beverage. Simple but good and thanks to PsjKids for preparing it. We formed into teams of 2-6 people. 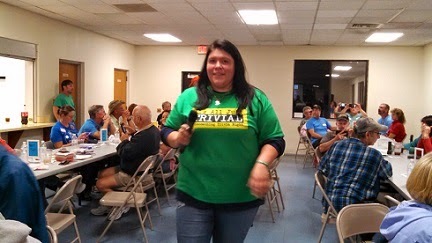 There were seven rounds of trivia questions, mostly geocaching related. 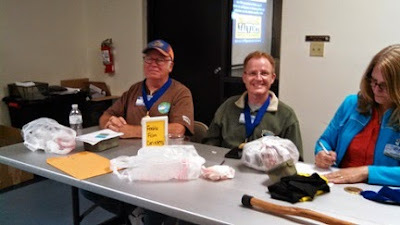 Between each round hoosiersunshine gave out prizes for such things as "Who is the oldest geocacher here?". "Who has the shortest geocaching handle?" (RonC won that one) and many others. It was a lot of fun. This is a traveling trophy. 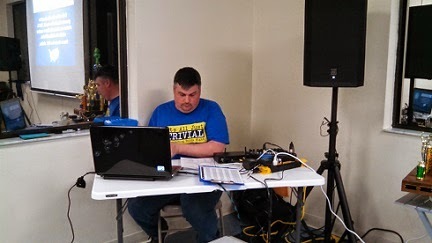 It appears at all events hosted by this dynamic duo. The winning team gets their name on the trophy and their picture on the Geocaching Trivia website. How cool is that? And of course the trophy is trackable (TB4ZX88). At the very beginning I got scared thinking that the winner was going to have to take this monster home. Tonight's winner was Team Feeble Film Canisters. Congratulations to them. I do not know, but am curious to learn, how many years of geocaching and how many Finds are represented on that team. Maybe they can tell me. My information on the teams is incomplete and probably contains errors. I would appreciate comments from anyone who can fill out or correct this data. What is the lowest/smallest five digit prime number? 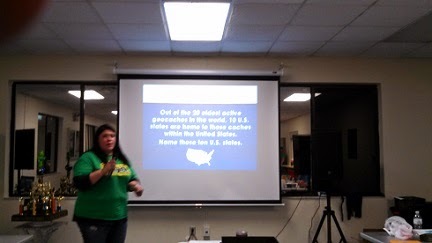 That was one of the trivia questions in the category What does that have to do with geocaching? That was a piece of cake for us math wonks. 10,001 of course. (Hear buzzer scream) What??? Then it has to be 10,003. (Hear buzzer scream loudly again). Sheepishly How about 10,005? (Hear buzzer scream louder and longer). Totally humbled, I crawled under a nearby rock. First, the definition: a prime number is a positive integer that is not divisible without remainder by any integer except itself and 1. What about 10,001? RetiredGuy found factors of 10,001 to be 73 and 137 (73x137=10,001). So it is not a prime number. How about 10,003? No 7x1,429 = 10,003. Not a prime number either. How about 10,005? Nope 3x5x23x29 = 10,005. No cigar here. I don't know how Retired Guy (+Doug Macrae) found his answer. Maybe he will respond with a comment to this blog post. This evening I met Julio (CuteLilFuzzyMonkey). He claims to have found 532 geocaches in one day (22 Feb 2015) and over 10,000 in less than one year of geocaching – and he has a full time job. I checked his profile and his current total of geocaches and trackables is 11,409. He joined on 23 Dec 2013. Congratulations to him and sympathies to his wife. 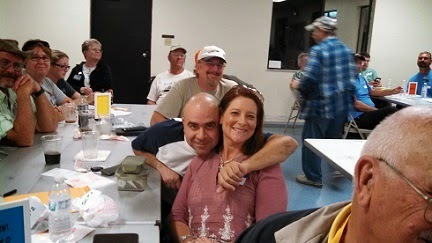 GC5HYBP -- "Castaway Cachers Trivia Night on the Space Coast"
AQ238337 "Kiwanis Island Park: Get Out There and Play"
TB4ZX88 -- Trophy: The Golden Geopile - It's All Just Trivial Event Trophy. This trophy is awarded to the winner of It's All Just Trivial - Geocaching Trivia Events. 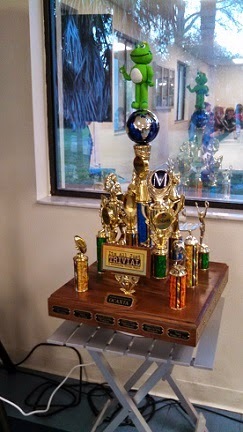 As a perpetual trophy, the winning team's name is added with each event along with the event location and date. The trophy makes an appearance at every trivia event put on by these folks. 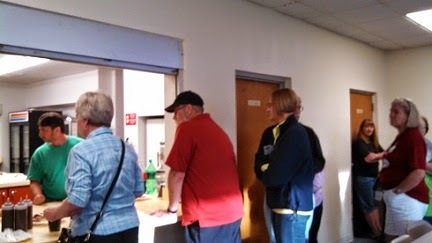 Here is my count of those that attended. If you didn't log the event as "Attended", I didn't get you. It was a great evening. What a way to start a carribean cruise. Thanks to all who made it happen. Your work is appreciated. I appreciate comments of all kinds from one and all. I prefer that they be entered as comments on the blog rather that replies on the email. Please feel free to forward this to those who might not have received it. I don't have email addresses for everyone.